dessert girl: Superman Ice Cream Fans Unite! Superman Ice Cream Fans Unite! I'm loving this video by Quinn Strassel (The Mitten) about Superman ice cream. Inspired by the Serious Eats post on this colorful treat, Quinn took to the streets to try to find out more about this mysterious flavor. Apparently, Superman ice cream is only a Michigan thing or, at the most, a Midwest thing. Who knew?? Click here for the full post. In Canada we have a chocolatier / ice cream store called Laura Secord. Superman ice cream sounds & looks a lot like the flavor "superkid" that they have at Laura Secord. It's my hubby's favorite and we always pick up a pint to take home. Interesting! I'll have to check out Laura Secord. Thanks for the info! 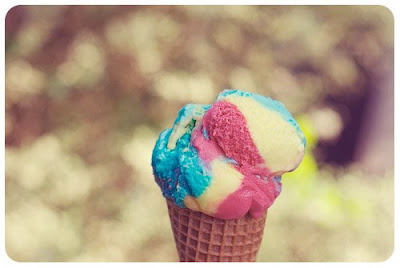 I love superman ice cream! I tend to indulge when I come home.